And on the chocolates too! February 14th, Valentine’s Day, is seen as a celebration of the expression of love and affection. In the U.S., about $20 billion was spent last year and on average, an individual spent about $146. Nearly $2 billion was spent on flowers alone. Valentine’s Day is a celebration of “romantic love” that, like Christmas, serves as an economic boom for a capitalist retail industry. As to be expected under capitalism, this love is expressed through material possessions and has been dutifully marketed by corporations that it should be expressed through red roses, chocolates and cards. Valentine’s Day is the most profitable time for the flower and chocolate industries. What has yet to be publicized during this holiday of capitalist invention is the origin of all these flowers and chocolates. They certainly are not from your local garden nursery nor Hershey, PA. Like most commodities, these items are brought to the U.S. and white world from the blood and sweat of colonized workers worldwide. Flower industry: Long history of exploitation! Specifically, 60 percent of flowers in U.S. come from Colombia. In Ecuador, one-third of its flower imports are shipped for Valentine's Day alone. Until recently selling its flower division, Dole Food Company (formerly known as Standard Fruit Company), the largest producer of fruits and vegetables in the world, controlled the flower market. Sanford Dole, the cousin of James Dole and the founder of what would become Dole Food Company, began exploitation in the Americas by overthrowing the Hawaiian Kingdom in 1893. Sanford Dole was the first and only president of the provisional government of Hawaii that paved the way for its annexation and occupation by the U.S.
Chiquita Brands International, another parasitic capitalist corporation that is well-known as the largest producer of bananas, was also active at one time in the flower market. These companies have been responsible for countless murders of labor activist, the funding of paramilitary groups throughout Central and South America and even coups. Dole has played a role in trafficking cocaine and fueling the Colombian civil war by funding whichever group serves its interests at a particular time. Dole and Chiquita were implicated in 2009 for the overthrow of Manual Zeleya of Honduras because he dared to increase the country's minimum wage. To speak about all the atrocities perpetrated by Dole and Chiquita is beyond this writing. It was the reprehensible conduct that was being exposed coupled with dwindling profit margins that lead these companies out of the flower industry. Their actions have set the stage on how workers are treated in the flower industry, who typically work 12 hours a day bent over cutting flowers, de-thorning the flowers and packaging them for a few dollars’ a day. While Central and South America dominate the capitalist consumption of the flower industry for the U.S., in Africa, Kenya provides more than 40 percent of Europe’s flowers. Kenyan flower laborers make less than a $1 a day. This parasitism robs the people of these colonized countries of their wealth. The oppressed and colonized workers in these countries are forced to produce flowers for parasitic capitalist countries instead of using their arable land to feed themselves. The majority of fresh flowers are given at this time of the year. This is no different from many of the other industries that the capitalist exploit like the chocolate industry. 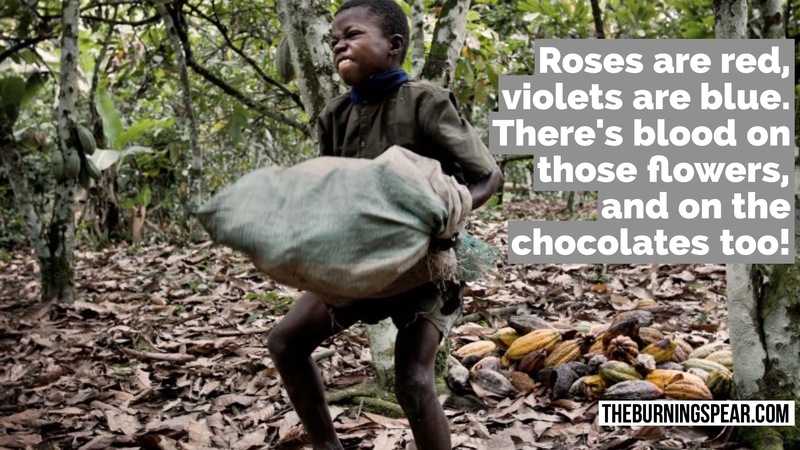 Chocolate industry rampant with child labor and slavery! West Africa supplies more than 70 percent of the world’s cocoa, the base ingredient for chocolate. The largest producer in West Africa is Ivory Coast where 60 percent of the Ivory Coast’s export revenue comes from its cocoa. The average cocoa farmer makes less than $2 per day, but this is not even accurate because child labor and slavery are rampant on cocoa farms. It is repugnant that the majority of these cocoa workers have never even tasted chocolate. The giant corporations of the chocolate industry Hershey's, Nestle and Godiva have all been cited for using child and slave labor. Nestle has a more peculiar history. The conglomerate that also sells bottled water was given permission to pump hundreds of millions of gallons of water from Michigan aquifers while the African people of Flint, Michigan were forced to pay for poisoned water. Recently, Nestle also lost a U.S. Supreme Court case that now allows it to be sued for its slave labor crimes in West Africa. Today, Godiva is the gold standard for chocolate, but few know that it too is rooted in colonial violence. Godiva is considered the high-end brand of the chocolate industry because of its Belgium roots. King Leopold of Belgium held the Congo as his personal property. During the production of rubber, the Belgians committed numerous atrocities against Africans. Africans were mutilated with their hands cut off or even decapitated if they did not meet their daily quotas. “Belgium chocolate” was considered the best because huge swaths of land in the Congo were reserved for the production of cocoa where Africans were enslaved. Similar mutilations happened on these farms as well. In fact, to this day chocolate hands can be purchased in Belgium shops––a distasteful and arrogant reference to the piles of hands of Africans cut off by the Belgians in its genocidal exploitation of the Congo. Creating a new world free of capitalism! The depth of destruction of human life for the pleasure of the oppressor nation cannot be adequately surmised in words. As Chairman Omali Yeshitela of the African People’s Socialist Party explains, the colonial assault on Africa and the Americas lays the basis for everything the white world possesses. The waste of growing flowers and chocolate in places where there is not even clean water and food is scarce cannot be quantified. Capitalism must be destroyed so that the resources of the oppressed are used for their own interest not to make those in the oppressor nation feel “loved” for one day of the year. Also undergirding this holiday is the colonized population’s collective use of something as innocuous as love to obscure the holiday from its exploitation of labor, land and other resources. Even the emotions of those who celebrate the holiday are being exploited in that capitalism creates an obligatory relationship where loved ones buy gifts for their love. Only revolution can overturn this clear parasitic relationship the white world has with the colonized. In creating our revolutionary project, not only will we be responsible for taking back our resources but infusing revolutionary culture in every aspect of our life––even concepts like love. This Valentine’s Day, instead of throwing your hard-earned resources to flowers and chocolates with the blood, sweat and tears of your colonized brothers and sisters, give your loved-one a subscription to The Burning Spear newspaper! Give them a true labor of love!